I wish the real world of India were like Namaste Fukuoka. According to the official source provided by Mr. Dharmendra Kumar, the event organizer of Namaste Fukuoka, the two-day visitors counted more than 40,000*. On 21st and 22nd April, when the temperature in Fukuoka acutely soared to nearly 30 degrees Celsius, which was quite untimely resembling Pune's early summer, Namaste Fukuoka 2018 took place at Tenjin Chuo Park in the heart of Fukuoka City. While claimed to be a local Indian and India related people-centric event started since 2016, it has grown rapidly and this year invited the Indian Consular General from Osaka and Miss World Japan as chief guests. On the stage, colorful performances by the topnotch performers from both India and Japan, including a Kathak dancer straight from Bengaluru, Japanese Odissi dancers based in Fukuoka, yogis and yoginis (source: ナマステ福岡2018 ステージ出演者一覧.) Also, Air India and Incredible India (the tourism bureau under the Ministry of Tourism) co-hosted a booth called "Tourism India," although no officials from neither bodies attended. Eventually, I participated in the volunteer supporting staff members for the booth and shared memorable experiences with other members whom I met first on the day. Hair accessories of Japanese Odissi dancers. Needless to say, Fukuoka's leading curry shops, Indian and Nepali restaurants set up their stalls selling the yummiest collections from their menu. The aroma of mutton masala and jasmine rice was irresistible. As far as this year is concerned, the fee for setting up a stall is uniformly 35,000 yen for two days (source: 【ナマステ福岡2018】出店者・出演者二次募集,) which is far reasonable and simple as compared with the fee for Namaste India, the largest annual India mela held in Yoyogi Park, Tokyo that starts from 100,000 yen (except for NGO/NPO) and goes up to 660,000 yen (source: ナマステ・インディア2015出店案内) for (I guess) again two days. What I was impressed? Well, those were too many. First, proactive, cheerful and flexibly-minded Indian and Japanese core-staff members were literally collaborating with a smile on their faces all the time, the typical example of crossing beyond the borders and regions. On the top of them was Dharmendra Kumar, the key person and the leader of Namaste Fukuoka. "Everything starts only when people are connected; so let's get together and know each other," was the only statement he made at the conclusion of the Namaste Fukuoka 2018 in the evening on 22nd April. Short, concise yet impressive his ending note was, unlike other typical Indian so-called event organizers who are usually busy crediting themselves for great works and achievements. As Dharmendra stated as above, I met many interesting people and made new friends during those two days. One of the most significant people was Mr. Mitsumaru Sugiyama, who had a mission of spreading the awareness of Green Fathers, i.e., his father and grand father, dedicated their entire lives bridging between India and Japan, including planting the trees and bushes in the rural Punjab and Gujarat for better farming and thus food productions. Namaste Fukuoka already starts producing miracles, just like the Big Bang. I hope it continues in the next year, next to next year and so on for generations. Secondly, among just a few dozen Indian residents in Fukuoka, Manipuri counts about 15 that is a remarkable number. 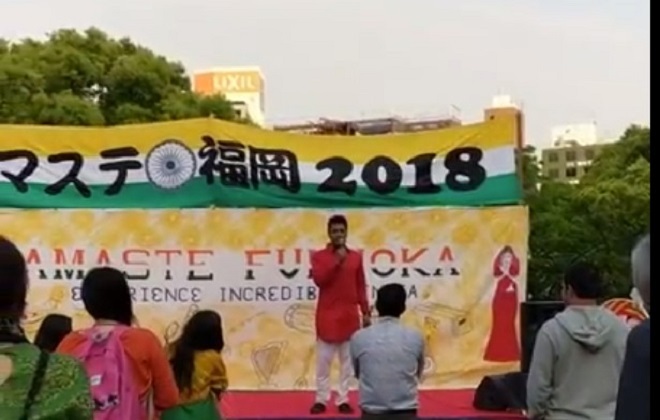 According to V-san, an Indian student from Imphal who also helped Tourism booth with me on the second day, his Japanese language school in Fukuoka and a school in his hometown has an association since 5-6 years ago and that leads Manipur-Fukuoka ties like this. Thirdly, Japanese people's keen interest in curries and Indian cuisines. On the Day 2, when one of my friends in Fukuoka who hailed from Dimapur brought us a lunch box filled with Nagaland special dishes he cooked at home, all my friends in our booth and other staff members, including an Indonesian friend, rushed in and shared the meals. They simply cannot stay away from the new flavor of curries!! Finally, I have recognized how little I know about India. Living in India as a foreigner is not always fun-filled and exciting. Especially the middle-class people like us have to face hard, sad, absurd, and outrageous realities in many occasions. I often feel concerned about, hurt, and disappointed by people's behaviors and daily events, and repeatedly ask myself why I am still living in India and not running away. Namaste Fukuoka is for me a mini-utopia, unrealistic version of India decorated with shiny gems. *Updated on 10th May, 2018, as notified by Mr. Dharmendra Kumar.